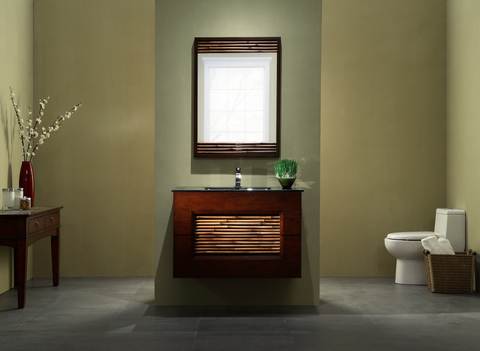 Xylem introduced its new BAMBU bathroom vanity and mirror set. The collection uses eco-friendly bamboo veneer and raw bamboo stalk accents to tie contemporary styling with nature-inspired accents. 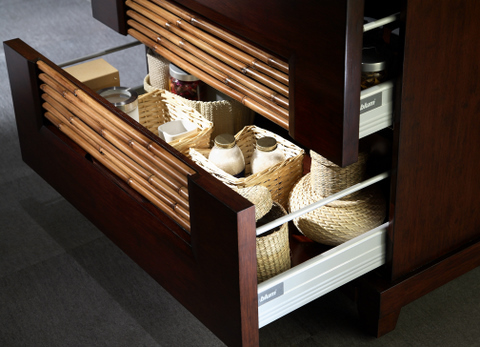 The clean, handle-free, console appearance of the BAMBU bath vanity offers no hint of its two spacious drawers. 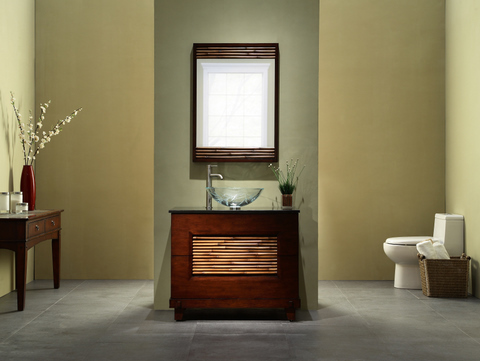 The BAMBU vanity is offered in a choice of wall-mount or base-stand applications 26″ and 36″ wide. 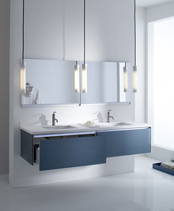 In 2009 the Xylem Group, LLC acquire the Loft & Bath® and Coret® luxury brands from the Zoli Corporation. 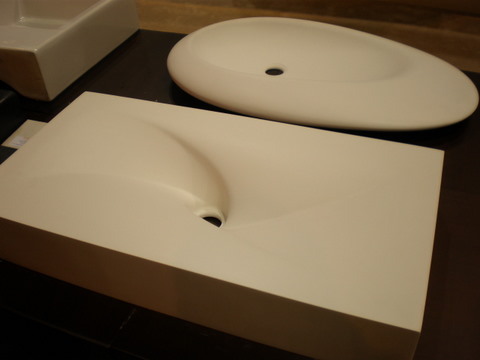 The Gira Basin displayed at the show is so spectacular everyone had to stop and touch it. 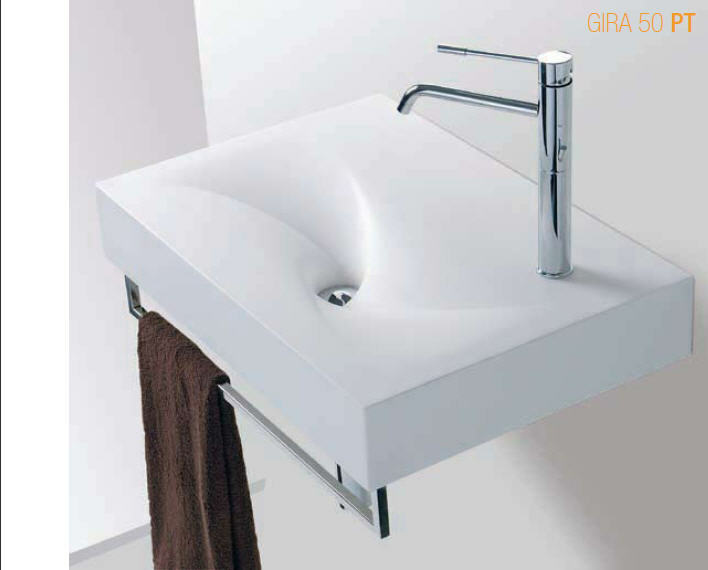 The Zoli Permesso Series of lavatories are made from a proprietary and patented material called Coret®. Coret is a synthetic material made from a combination of resins and alumina. These special components give the product a matte satin finish combined with a very natural “soft to the touch” feeling. Coret is fire-resistant, chemical-resistant, stain-resistant and the finished product also has a very high resistance to abrasions. 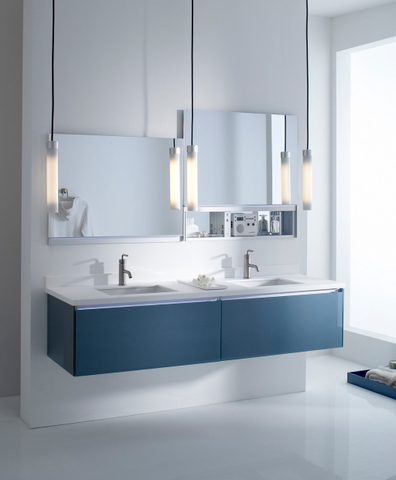 To the joy of designers everywhere, Robern has expanded their product line to offer wall-hung vanities. 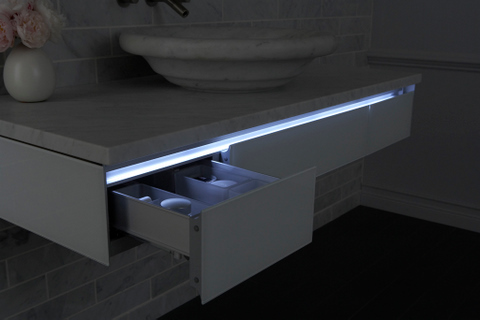 These contemporary vanities are constructed from aluminum and glass with a night-light along the top channel. Aside from the beautiful styling, the interior accessories will make every woman want one. Glass storage bins neatly hold cosmetics and the hairdryer and curling iron holders are well thought out with safety and convenience in mind. 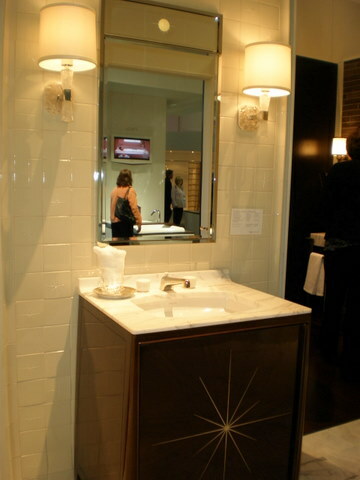 Barbara Barry introduced her fourth Collection for Kallista at KBIS. The Counterpoint Collection by Barbara Barry is inspired by the minimal elegance of the 1930s. 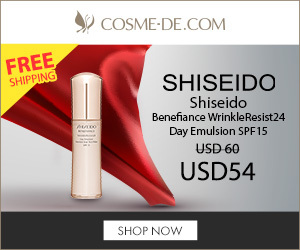 This collection is distinctly modern and sophisticated. 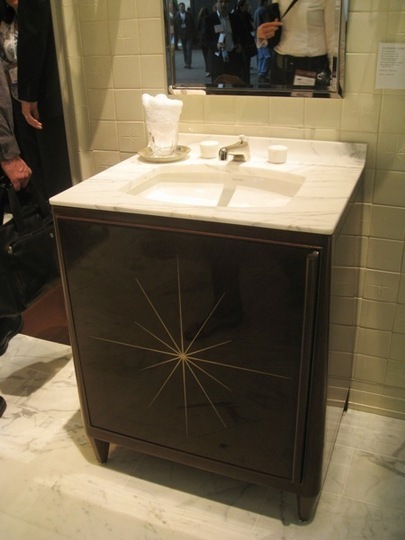 The vanity features a startburst wood inlay, Barbara Barry’s signature motif. It will be offered in two wood finishes, Barry’s signature deep, dark Java finish, or the warmer tones of Brunette, a new finish designed exclusively for the collection. The marble countertop is available in Statuary White or Crema Marfil marble with undermount bowl. A coordinating medicine cabinet features a beveled mirror with the same startburst etched into the top. 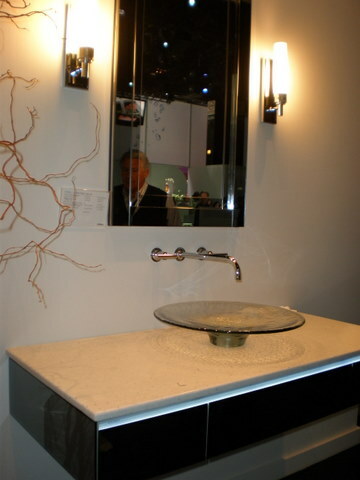 Native Trails showed two new vanities at the show; the Yanama and the Savannah. I’m sharing the Savannah Vanity which is entirely handcrafted using Forest Stewardship Council (FSC) certified wood in a one-of-a-kind distressed finish. The 30″ Antique White vanity is avialable with with the Lava, a dark charcoal grey basalt or Crema, a lightly polished marble tops and your choice of sink. I love it with the Calypso basin as shown in the photo. Look for it to be available in May. 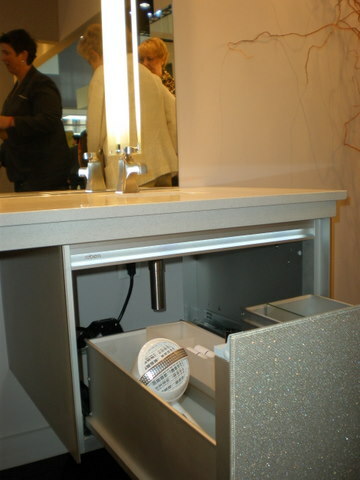 Pingback: The Basic Facts Of Modern Bathroom Vanities | Wolfs Article Den. i love the pictures! Could i share them with some friends? 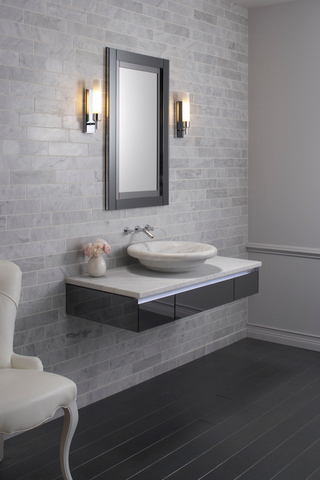 We are delighted with this vanity. I just got the water running. It was packaged with 4″ foam all around, and was not damgaged at all, from shipping. It is easy to install, and all together took around 1-2hrs to assemble, and another couple hours getting all the plumbing hooked up. I did have to modify the lower drawer to accomodate the water valves, but otherwise the plumbing fit nice.